Dreams and Drama: Final Guest of the Month - Its Jenny Fab!! Hi friends of Swarnali! My name is Jennifer Fabulous and I am so honored to be guest posting on Dreams n Drama. 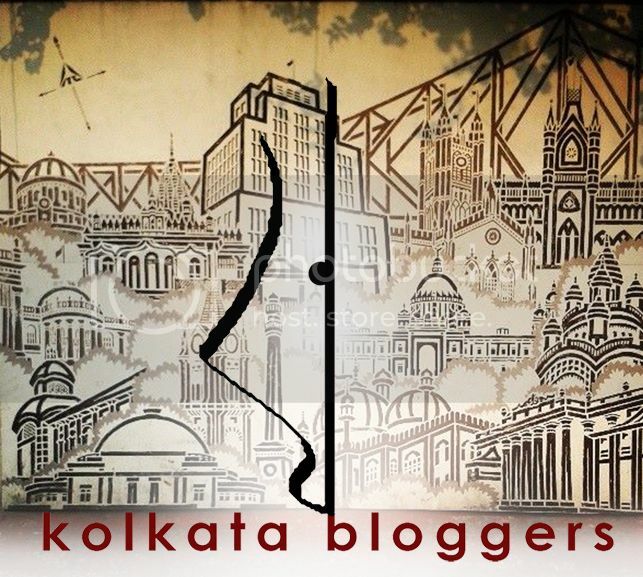 I have been a big fan of this blog for a while. On my blog I write quite a bit about pop culture and celebrities. Like any other girl, I'm a huge fan of movie stars and rock bands. I've even done a few crazy things in my past to get close to celebrities (such as jumping out of shrubberies, sneaking on tour buses, and jumping on stage during concerts). 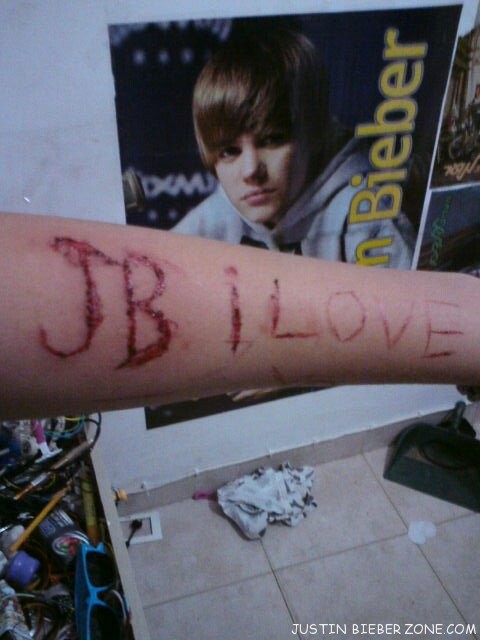 But there are some people who take their obsession too far. Today, I'm going to focus on crazy fans. Let's start with Twilight. 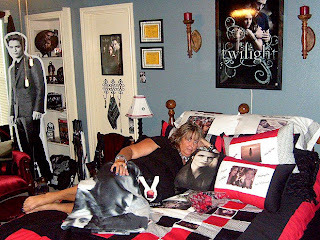 I think we can all agree teenage Twilight fans are some of the craziest people on the planet. And I mean that in the kindest way possible. But there is one person who just might take the title as the most bonkers. Linda Moore, a 56-year-old woman, told People Magazine that after her husband refused to let her decorate their bedroom in Twilight memorabilia, she decorated another bedroom in the house instead. The Texas woman's Twilight shrine has turned her into a celebrity in her small town. If you think that was nuts, let me introduce you to a die-hard Harry Potter fan in the United States, who legally changed his name to Lucius Malfoy. The middle-aged man reached out to Tom Felton, the young actor who plays Lucius in the films. He showed Tom actual legal documents which would allow the actor to disown his parents and move to the United States to live with him in his house, which he had also named Malfoy Manor. Tom has been quoted as saying it was one of the creepiest encounters he's ever had as a celebrity. Speaking of celebrity names, a 36-year-old British father, Ian Clark, sparked controversy two years ago by allowing his four-year-old stepdaughter talk him into naming his newborn daughter "Lady Gaga." Unfortunately, the new dad didn't feel any pain after making it legal on his baby's birth certificate. Because a year later, he let the same stepkid talk him into naming his newborn son "Will.i.am." I'm not sure what's worse: the fact that he's forcing his children to have these horrible names or that his four-year-old stepdaughter seems to have complete control over him. On a creepier note, a 15-year-old girl from Brazil expressed her obsession with Justin Bieber in a more...sinister way. Jessica Mazon, a former blogger, showcased a special message she had cut on her arm, expressing her love for the teenage heartthrob. In a blog post, which has since been taken down, Jessica wrote about her loneliness and depression and how her love for Justin Bieber was the only thing keeping her going. It is quite sad, actually. I really hope she has gotten some help. Last but not least, let's talk about two smelly girls in the United States who may just be the biggest One Direction fans on the planet. Two teenage girls recently hid in a trash can for FOUR hours in a desperate attempt to meet the boy band after a concert. Unfortunately, snuggling in hot, smelly garbage for several hours didn't pay off, because security gaurds found them instead. They never got to meet One Direction. What do you think of these fans? Would you do the same thing? If you haven't discovered her yet, its time you do. Catch ya with the next post. Ooppssss.......No. Never I would never ever do anything as crazy as this for sure. Some amazing facts, very nicely written. I can accept teens doing crazy stuff like this, but full grown adults, really creepy!! The Justin Beiber one is the worst! Along with that Miley Cyrus fan on your blog...two crazy, crazy people. The JB fan was actually scary!! That post on Miley was equally creepy. That was exactly my reaction when I saw the post. :D Thanks for dropping in. Yeah the idea of blind worship never really worked with me, I was never a real fan of anybody. These sort of extreme behaviour makes me doubt their sanity. Jennifer is a sweet heart ... Love her blog :) Crazy fanz...huh !! She sure is :D Thanks for dropping in. Thanks for dropping in. The baby names were the only funny part,rest was all terribly creepy. I do not really support hitting photographers and paparazzi but i do agree that people do take it too far, beyond the tolerance level. Wow. These are just super-scary. People need to stop with the hero-worship and take a step back and look at their own lives! haha yeah same pinch, I wouldn't do anything of the sort either :D I was never anybody's fan. Yes, absolutely...I completely agree to that one. Oh dear...!! That girl with the cutting issues is so scary! yeah its so scary, isn't it? People collecting memorabilia are acceptable but mutilating themselves is way beyond normal. Mental it sure is!! Thanks for dropping in! !